This thoughtful get well gift basket will help to lift the recipients spirits. 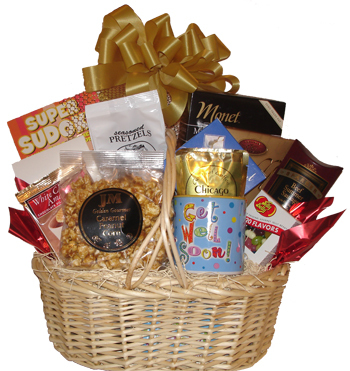 This thoughtful get well gift basket will help to lift the recipient’s spirits. We’ve included a colorful get well mug, brown-sugar cookies, coffee, cheese, crackers, summer sausage, a Sudoku book, key-lime white chocolate cookies, seasoned pretzels, Belgian truffles, white chocolate amaretto cookies, caramel corn, Swiss chocolate, and Jelly Belly candies. The recipient will be pleased that you thought of him or her. Recipient not into Sudoku? Not a problem. Tell us below and we’ll substitute the book for another treat! Available at $85, 69, and $49.